A new hybrid technician performing both mechanical and auto body repair work and associated labor class might be needed to handle vehicles with repair procedures straddling both worlds, an executive at one of the nation’s prominent regional MSOs suggested this spring. 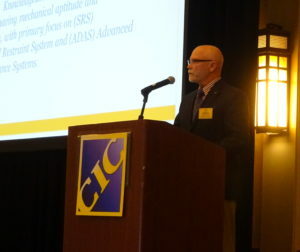 Darrell Amberson, LaMettry’s Collision operations president and Automotive Service Association board member, told the April 11 Collision Industry Conference that it made sense to have a “unique technician” on hand for scanning, calibration and work on advanced driver assistance systems and supplemental restraint systems. Co-presenter ASA Chairman Roy Schnepper (Butler’s Collision) said that many shops have had discussion with insurers about such advanced technology, with questions arising like “‘Can’t the porter do that? '” that equate the work with simply plugging in a device. Automotive Technician skilled in computer functions, advanced diagnostic equipment, and new vehicle technologies. 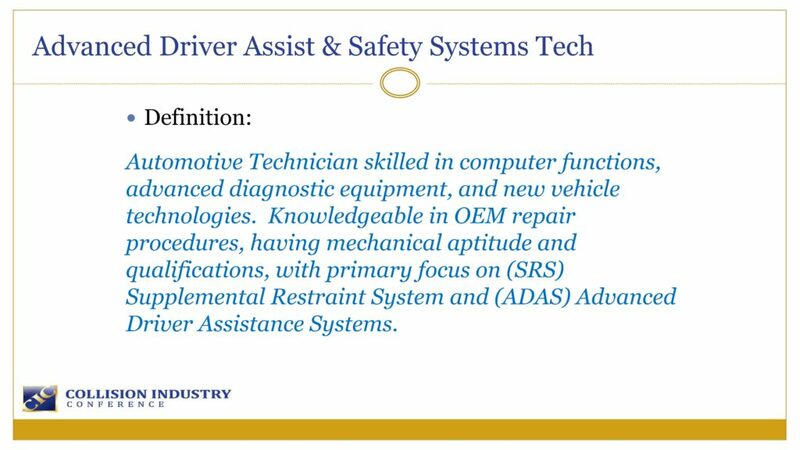 Knowledgeable in OEM repair procedures, having mechanical aptitude and qualifications, with primary focus on (SRS) Supplemental Restraint System and (ADAS) Advanced Driver Assistance Systems. VeriFacts CEO Farzam Afshar said Europe for years has offered such a role, known as an “EMT” — electrical, mechanical and trimming role. Schnepper offered an anecdote of working on a Toyota Highlander which had received a replacement driveshaft. The battery had gone dead during the procedure. The shop charged it back up, but “the car would do nothing” — it lit up, but “nothing would happen,” he said. It took about 45 minutes to an hour of reading through repair procedures and hooking up a scan tool to find out the passive alarm system had activated, Schnepper said. It’s important that “knowledge is there,” he said. Amberson recalled a 2017 Ford F-150 at LeMettry’s in which the electronic power steering didn’t work following the shop replacing and installing a headliner for hail damage. Disconnecting components at the back of the vehicle meant a couple of modules weren’t able to talk to one another; LaMettry’s was able to ultimately fix it with a scan tool. “This is a basic hail job,” he said. As if that weren’t enough complexity, Amberson said he was informed by an employee that the issue is unique to the Ford EcoBoost engine. Such unusual situations led to the new labor category and focus on the talent necessary to fill it, he said. AirPro operations Executive Director Chuck Olsen said he sees such skill sets growing in traditional collision repair roles, but “it runs the gamut.” Some shops want to be hands-off and told what to do, while others are “very interested,” get involved, and can handle most of these tasks themselves. Amberson asked the audience how many of them could get into any vehicle in one’s shop and understand how lane observation, adaptive cruise control or blind spot warning worked? He suggested they all needed “this technician” — the hybrid — whether he or she worked directly for the shop or a sublet entity. However, he also noted the percentage of LaMettry’s business that would be considered traditional mechanical work — which would include electronics — is “just going to continue growing,” and he fears having to send out 25-50 percent of a job. Instead of subletting the work, it could be a new profit center, he said. Amberson said he included SRS systems in the ASA definition because of their complexity and the risk of injury or death from improper repairs. Side airbags carry different requirements for replacing certain clips and trim pieces, and Amberson said that when writing an article (presumably this April 2 Auto Body Repair Network piece) about the hybrid tech, he pictured an airbag triggering next to his face and head and clips flying at him. He would want the technician to have the “highest competence” and an understanding and ability of how this all was put together, Amberson said. Amberson told the CIC he was blessed to work for a company with multiple such hybrid technicians. “We are becoming more and more reliant on them every day,” he said. LaMettry’s is trying to “grow more of them,” he said. Shops might say they’re too small for such a role, but Amberson said LaMettry’s has learned that a shop with just 4-5 body techs that scans every car and performs calibrations will have enough work to keep a hybrid tech busy full-time. Amberson suggested that the information providers add such a category so more clarity and understanding existed of what to expect. LaMettry’s charges mechanical rates for its hybrid technicians, for it has to pay these employees a great deal to keep them, Amberson said in an interview. However, he said he was advocating for an entirely new labor category within the estimating services rather than just declaring such specialized utility players mechanical technicians. Such a new labor category might carry “cost differences,” Amberson also told the CIC. Trim pieces associated with a supplemental restraint system might cost more to repair, he said, an apparent comparison to traditional body trim labor rates. However, consider the safety issues, Amberson said. “We want the highest caliber technician working” on the systems in question, he said. 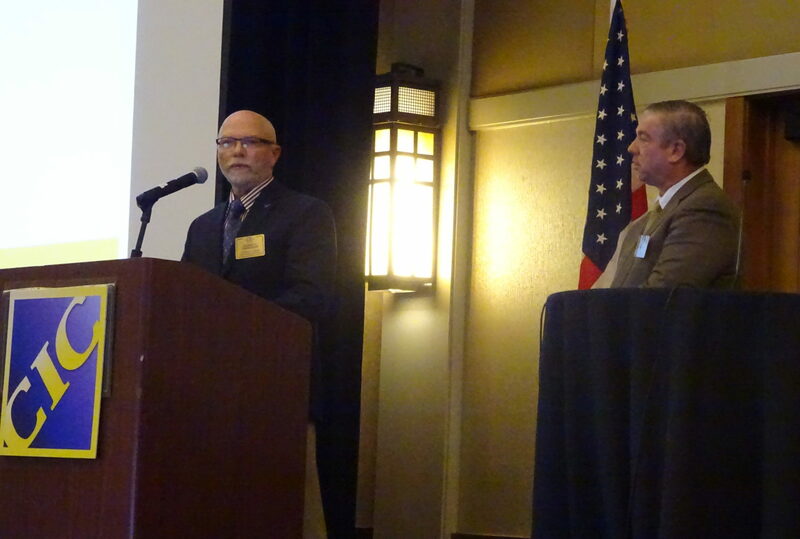 A higher rate also might address a concern raised by Society of Collision Repair Specialists board member Tim Ronak (AkzoNobel), who told CIC there’s an “unbelievable cost” of training to handle the technology of today, and it’s not a one-time cost. With the industry operating at a modest profit margin, it’s not well-positioned to fund it, he said. “We have no choice but to figure it out as an industry,” Amberson said. Yeung recalled a recent high-profile Tesla Autopilot crash and asked the audience to consider the liability if the vehicle had last been calibrated at their shop. 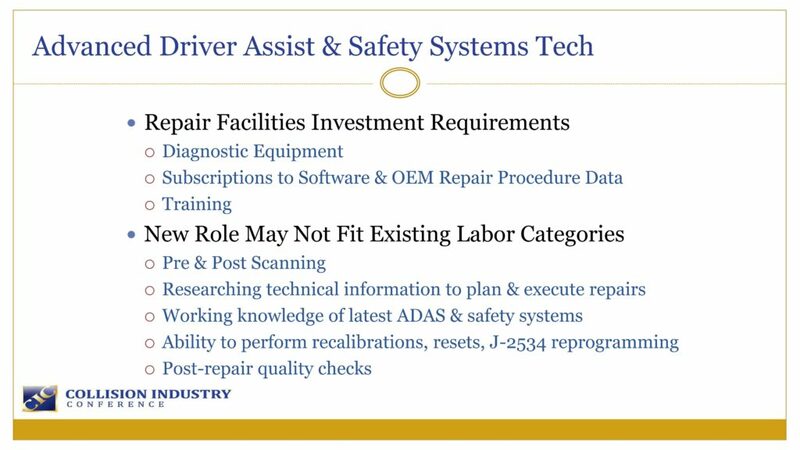 So many vehicles have such technology, “it is our duty” to return it repaired to the best of the shop’s ability with properly trained employees. “This is just spot-on,” he said of Amberson’s message.